One of the best ways for a company to improve is to measure overall performance. Measuring performance helps a business evaluate its goals and how far it has gone to reach them. Introducing performance dashboards can help track, adjust and thereby increase a business’ financial earnings. Below are benefits of using performance dashboards that result in greater financial stability for companies. Business managers have the critical mission of identifying market trends and know at all times how they affect their business. A dashboard makes it easier to identify, analyze and correct negative and positive trends thus allowing managers to streamline their activities for better business growth. For big and small businesses, measuring the overall performance is a daunting task. As much as a company may look good, truth is there are broad issues which might not be easily noticeable. 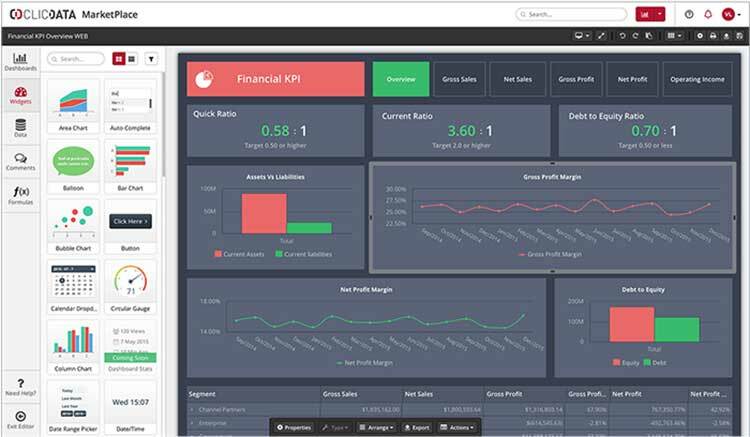 The dashboard’s analysis feature allows managers to measure performance and correct any disparities to avoid any future losses and to increase income. You can program most modern-day dashboards to suit usability in mobile devices. This feature is timely with the advancement in technology where mobile devices are everywhere, making it easy for managers to access the dashboard anywhere to respond to issues in real-time. This feature allows users to customize the dashboard to give them particular information in line with their expectations, meaning they will only be getting valuable information details they need to increase their job efficiency. ClicData includes all of these critical features and more. The platform makes it very easy to create powerful dashboards, and create new views of data thanks to the integrated ETL tools. Analysis can be shared instantaneously as critical thresholds are reached. A free subscription is available. This article was contributed by ClicData.